Louis Robert Wolheim (March 28, 1880 – February 18, 1931) was an American actor, of both stage and screen, whose rough physical appearance relegated him to roles mostly of thugs or villains in the movies, but whose talent allowed him to flourish on stage. His career was mostly contained during the silent era of the film industry, due to his untimely death at the age of 50 in 1931. Born in New York City in 1880, he attended Cornell University, where he graduated with a degree in engineering. After graduation, he taught mathematics, including 6 years as an instructor at Cornell. He also worked as a mining engineer. 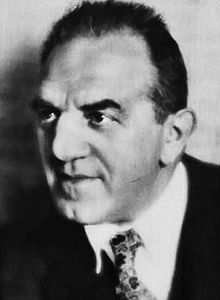 According to Wolheim, while at Cornell, he suffered an injury to his nose during a football game, and, after having the nose seen to by medical professionals, later that same day he got into a physical altercation (which he won), although his nose suffered more damage, ending up becoming almost a trademark for him. After the United States entrance into World War I, Wolheim joined the United States Army, and was in officers training at Camp Zachary Taylor in Louisville, Kentucky when hostilities ended. Not wanting to remain in the service as a career, he asked for and was granted a discharge. According to Art Leibson's book Sam Dreben: The Fighting Jew (Westernlore Press, Tucson, Arizona 1996), just before World War I Wolheim was in Chihuahua, Mexico selling raincoats and rubber boots to revolutionaries, when he met Sam Dreben, an American mercenary. According to a 1933 article in Liberty Magazine by Tex O'Reilly. Wolheim and Dreben were noted for their drinking and fighting in Mexican cantinas. One time Wolheim beat up a Mexican officer and was put in jail. Dreben rushed to the prison and secured Wolheim's release. When Dreben died in 1925 on the West Coast, Wolheim was living there and served as one of his pallbearers. In 1914, on the advice of Lionel Barrymore and John Barrymore, Wolheim entered films. Both brothers also invited him to appear in the 1919 play The Jest in which the Barrymores co-starred. He would appear in at least five films with Lionel Barrymore including a serial and four films with John Barrymore, The Test of Honor (1919), Dr Jekyll & Mr Hyde (1920), Sherlock Holmes (1922) and Tempest (1928). Wolheim appeared in two silent films with their sister Ethel Barrymore. Wolheim's fearsome visage almost immediately typecast him in roles as gangsters, executioners (as in D. W. Griffith's Orphans of the Storm) or prisoners. Towards the end of the 1920s, he occasionally broke out of these stereotypes and played a comic Russian officer in Tempest and a rambunctious Sergeant in Howard Hughes's Two Arabian Knights. He also played a Chaneyesque gangster in Hughes's splendidly photographed The Racket, a lost film for over 70 years recently rediscovered. Beginning with his appearance in the Barrymores' play The Jest, Wolheim would appear in ten Broadway plays from 1919 through 1925. He received considerable acclaim as Yank in the original stage production of The Hairy Ape (1922) by Eugene O'Neill. His final play would be as the lead, Captain Flagg, in What Price Glory?, in 1925. The play would be made into a film a year later, with Victor McLaglen in the role of Flagg. 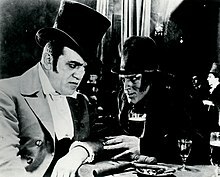 In 1922, with his fluent French, Wolheim translated Henri Bernstein's play The Claw into English, which his friend Lionel Barrymore had a successful run on Broadway in. Wolheim acted primarily in silent films, because of his sudden death at the close of the silent era, but he did appear in several talkies, including All Quiet on the Western Front and Danger Lights (both 1930) before he died. Wolheim was credited for a screenplay in addition to his acting career, for The Greatest Power, which starred none other than Ethel Barrymore. At the very end of his career, his final appearance was in The Sin Ship, which was also his only directing credit. The film was released in April 1931, after Wolheim's death, however after its completion, Wolheim had decided that directing was not for him, and had stated he would only act from that point forward. According to the biography included in the DVD version of All Quiet on the Western Front, Wolheim wanted, at one point in his career, to play romantic leads instead of tough "heavies". To that end, he sought to have plastic surgery performed on his broken nose. Executives at United Artists successfully obtained a restraining order against him from doing so, however. Off-screen, Wolheim had a reputation as a genuinely caring individual, so much so that after his death, when flowers were usually sent to the funeral, his friends and co-workers instead took up a collection and gave the money, in Wolheim's name, to a fund to feed the hungry. James R. Quirk, editor and president of Photoplay Magazine, said of Wolheim, "This is no attempt to glorify an actor who has passed on. It is the truth, every word of it. Louis Wolheim was one of the finest and most generous souls I have ever known." While preparing to appear in the film The Front Page, Wolheim died suddenly on February 18, 1931, in Los Angeles. He had been losing drastic amounts of weight for the role, and news accounts from that time attributed his death to that weight loss. However, modern sources attribute his death to stomach cancer. He would be replaced in The Front Page's cast by Adolphe Menjou. Wolheim is interred at Hollywood Forever Cemetery in Hollywood, CA. ^ a b "Louis Wolheim". Turner Classic Movies. Archived from the original on August 23, 2014. Retrieved August 23, 2014. ^ a b Lang, Harry (January 1931). "Gr-r-r-r-r!". Photoplay. p. 66. ^ Lang 1931, p. 118. ^ a b "Louis Wolheim". Internet Broadway Database. Archived from the original on February 18, 2014. Retrieved December 16, 2016. ^ "The Claw". Internet Broadway Database. Archived from the original on July 12, 2014. Retrieved December 17, 2016. ^ a b "Louis Wolheim". American Film Institute. Retrieved August 23, 2014. ^ Schallert, Edwin; Schallert, Elza (March 1931). "Hollywood High Lights". Picture Play Magazine. p. 16. ^ "Gossip of all the Studios". Photoplay. January 1928. p. 100. ^ a b "The Hard-Boiled Samaritan". Photoplay. May 1931. Retrieved August 23, 2014. ^ a b Waterbury, Ruth (March 1931). "The Final Fling". The Silver Screen. p. 82. ^ "Louis Wolheim, full biography". The New York Times. Archived from the original on August 23, 2014. Retrieved August 23, 2014. ^ "Hollywood's Goings-On". Photoplay. April 1931. p. 45. ^ "The House of Hate". Silent Era. Archived from the original on February 25, 2014. Retrieved December 17, 2016. ^ "The Carter Case". Silent Era. Archived from the original on November 10, 2013. Retrieved December 17, 2016. Wikimedia Commons has media related to Louis Wolheim.